8 Channel PWM Lamp/LED dimmer module, 12V/24V, 5A per channel. Controlled by a single momentary pushbutton switch. 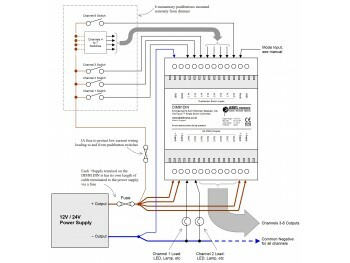 One-touch on/off and dimming control. 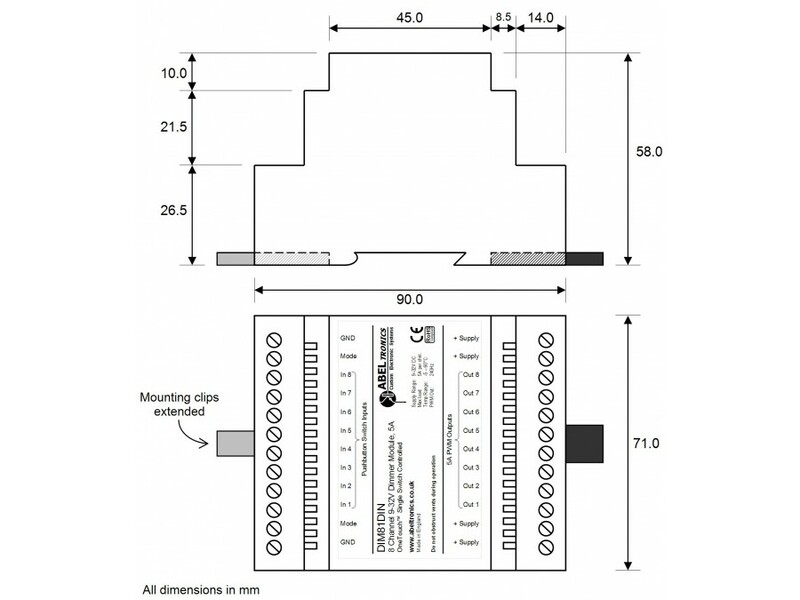 The DIM81DIN is a low voltage eight channel 12V or 24V PWM lamp and LED dimmer module controlled by a single external momentary pushbutton switch per channel. This single switch completely controls the dimmer operation: a brief press of the switch will toggle the lamp on or off, and a sustained press will cause the lamp brightness to ramp up or down for as long as the switch is held, repeating until the switch is released at the desired brightness level. The module features eight independent high-side PWM output channels sharing a common ground and is controlled by eight independent pushbuttons. 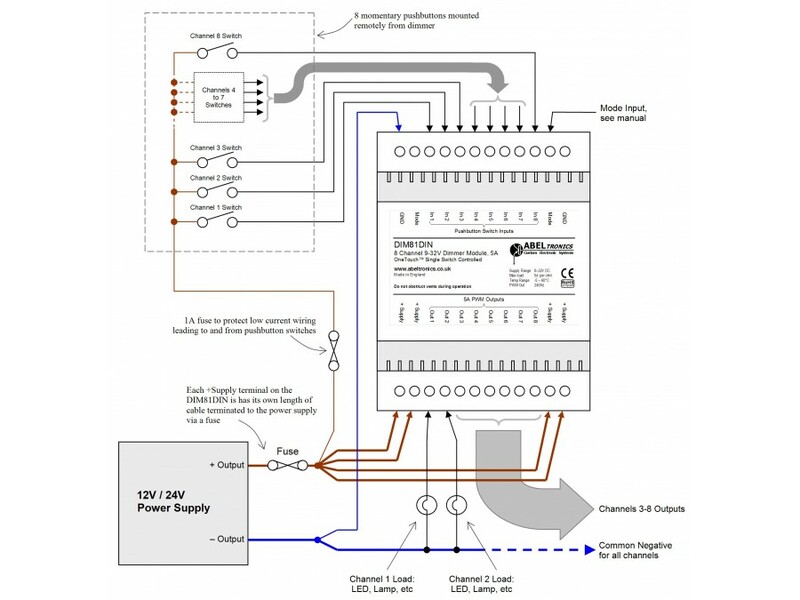 The Mode input controls the operating behaviour of all 8 channels of the unit and should be connected during installation. Leaving the Mode terminal unconnected, when the lamp is turned on by a brief press of the control switch it will operate at full brightness. The brightness level can then be changed by a sustained press of the control switch. The lamp will revert to full brightness when the lamp is turned off and back on again. With the Mode input connected to the +Supply terminal, when the lamp is turned on the previously stored brightness level is retrieved. The level can then be adjusted with a sustained press of the control switch. When the lamp is turned off, or when power to the module is lost, the current brightness setting is stored for retrieval next time. Regardless of the Mode input, the last-saved brightness level and on/off state are recalled when power to the unit is first applied. This ensures the current brightness level is not lost when power is removed, and any power glitches to the unit will not cause the lamp to suddenly change brightness or state. In addition, the brightness ramp direction swaps between switch presses - that is, if the brightness is currently increasing, the next sustained press of the control switch will cause the brightness to decrease. This allows the user to adjust the brightness accurately and quickly. The Control pushbutton can be any momentary pushbutton switch, or relay contact. The DIM81DIN is supplied without a switch, and a selection of pushbuttons is available separately from ABELtronics. There are four '+Supply' power connections on the module, two pairs at opposite ends of the enclosure. These are internally tied together but they should all be connected together externally if the total load (sum of all the channels) on the module exceeds 10A. The 'GND' connection and the 'Mode' Connection are duplicated to allow daisy-chaining of adjacent modules in a lighting control panel. The pushbutton switch inputs and Mode input are protected against over-voltage, although they should never exceed the module's supply voltage. The module is finished in a 4 unit wide standard vented DIN-rail mount enclosure.